Every year companies in the hospitality and healthcare industries generate millions of tons of textile waste. When terry towels and linens no longer meet quality standards, they must be disposed of, or recycled by the generators. Until now there has been no industry standard to recycle these materials - some use discards for cleaning rags, others simply treat them as waste. When terry towels, washcloths, and linens are recycled back into the same institutions they were generated from, the risk for cross contamination increases. Textiles that are now polluted with cleaning chemicals can accidentally be mixed with guest laundry and put back into circulation. Also, the discards are not uniform in their efficiency, cleaning ability, or appearance. Monarch’s Buy-back program allows generators to take the guess work out of textile waste. We wholesale recycled wiping rags under our ABW brand. Our sustainability efforts in the production of recycled cleaning rags and wiping rags helps to reduce waste and decreases the negative impact of soiled linens and terry towels on the environment. When used linens are brought to Monarch Brands they may contain substances that may be harmful to humans as well as the surfaces they are cleaning. This is especially true when buying from hospitals and hotels. Syringes, cutlery, pins, broken surgical equipment and even nuts and bolts have been found in rag bales over the years. Monarch Brands is invested in the health and safety of everyone who comes in contact with our wiping rags and cleaning rags. 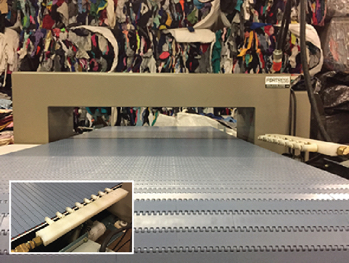 Recycled wiping and cleaning rags that leave our facility are put through our metal detector piece by piece by piece. The detector is extremely sensitive and blows rags with trace amounts of foreign objects into a discard bin. Save linen discards as they are generated in a heavy-duty tote provided by us. Call Monarch for a pick-up at your location. We will sort your shipment to evaluate the quality and weight of the discards. We’ll issue you a credit towards your next microfiber purchase, or simply buy the linen discards outright.